Just for kicks, I thought I’d apply some trading technical analysis to the Bitcoin Network transactions per second graph. Turns out we’re in a flag pattern and she’s gonna breakout sometime before May 2017. 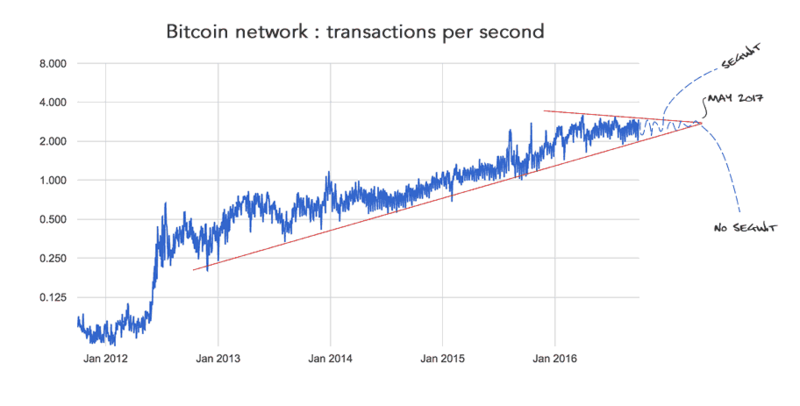 Behind all this are some more serious fundamentals… this graph is logarithmic so tx/s is climbing exponentially on a steady predictable rate since 2013. Meanwhile the capacity of the network is less than 3 tx/s but declining over time. Why? I think it’s the growth of meta protocols that are sitting on top of the Bitcoin blockchain like Omni and CounterParty. These transactions on average take up more bytes than simple native Bitcoin payments. One thing is for sure, we’ll need scaling solutions like Segregated Witness and the Lightning Network before May 2017.
Who will win the anonymous altcoin battle?